as i said in a previous post, the lita’s are the shoe that has outlasted the blog trend. i still like them even though they’ve been around and overdone and, to me, that is a worthy shoe. i think the brown ones (and maybe the taupe suede) are the most versatile shades, as i think the black is too heavy. 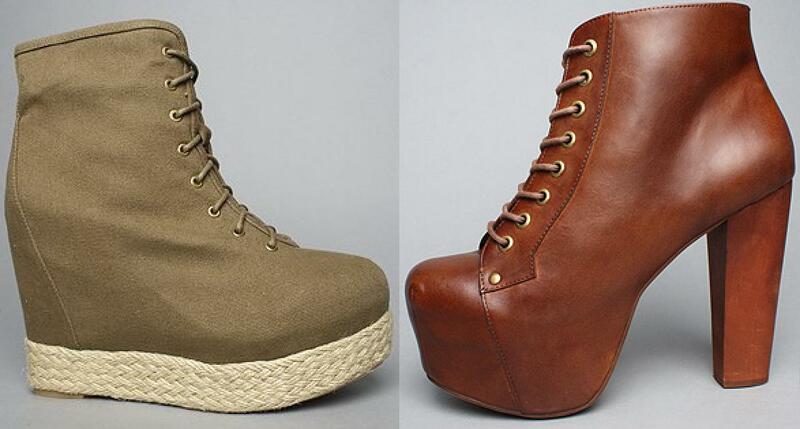 the distressed brown will go with pretty much everything that requires heels with a bit more of a tough edge. i don’t think the heel to platform ratio is too bad either, so they should be very comfortable. i’ve never mentioned the throwdowns before, but i’ve had my eyes on them for a while. especially when they got reduced down in the sale on karmaloop. i think the khaki shade is great to be worn as a neutral and would look good with any colour. if you go on karmaloop and type ‘SR426′ into the ‘rep’ box and ‘SAVE20‘ into the discount code box, you get 21% off your total order plus $8 off international shipping. as the postage price is really high to the UK, i basically got it for free with the code. got to love online discounts! tomorrow i’m going into town with sharon (as always) to help her look for a graduation dress for the 11th of july. we might go and see transformers aswell. i’ve got lots of little boring things to such as post some ebay stuff, return these trousers to topshop (which is the biggest disappointment ever as i was completely in love with them) and go to the bank.